I have million things I should be doing today. Instead I made a couple dozen of these cookies for a Hunger Games party tonight. Have you read the books? The final book comes out tomorrow. Don't be impressed with my piping skills. I cheated. I printed a picture and placed it under parchment paper. I piped the mocking jays with royal icing and let them dry for and hour or two. Once they hardened I pealed the off the paper. They were fragile but I could pick them up and place them on the cookies. I love this idea because I prefer a buttercream frosting over all royal icing. Now I can have a pretty picture and still have buttercream. I need to get to work again so I can waste more time reading Mocking Jay tomorrow. I've been pretty obsessed with these books and pre-ordered my copy of Mockingjay a few weeks ago...I wish I was at your party...looks like a blast!! I just started this series. Brilliant author! Beautiful cookies. I love these books. 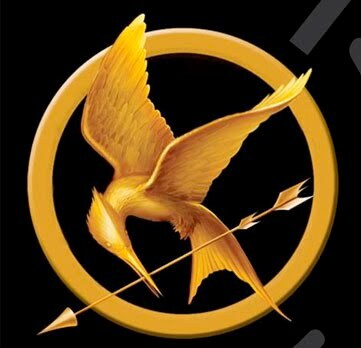 Can't wait for Mockingjay! I have not read the books, but have been tempted to. Seems everyone that has read them are obsessed....I mean like "Twilight" obsessed. So, I think I may give them a go. :) That is a great idea for a party! We read the books in my book club and I am so excited for the 3rd book tomorrow, I will have to run out and get it. Thanks for all the great ideas, I'd love it if you stopped by my blog sometime. I am so glad you liked the books too. I rarely recommend books to anyone. I really like this series so I blogged about it and a lot of people told me they read them at my recommendation and didn't really like them. SO I am glad I am not alone in being a fan and so excited for the next book. Those are extraordinary cookies! Amazing! Wish I lived closer so I can join in the festivities. I am just going to be waiting at the bookstore, coffee in hand for their opening tomorrow. Go Katniss! I just started the second book, per my daughter's request. They are good, aren't they? You did a great job on the Mockingjay cookies! love the books...adore the cupcakes. So clever! I'm tempted to make some to celebrate the arrival of our copy, if it ever gets here!!! Great piping. That's not cheating. It's a legitimate technique. Another one that you might try is the frozen buttercream technique. You might check out cakecentral.com for instructions. I've never heard of that book...but I'm pretty impressed w/ your piping skills! Your cookies look awesome!! LOVED the books and wish I could have come to your party! I thought you piped that with chocolate. I like that you used royal icing though. How fun. We are having a book club meeting for The Knife of Never Letter Go: Chaos Walking series. That's another good series to read. I think I will make some sugar cookies and make little knives to go on top. Maybe in red, how morbid!